Wouldn’t it be great if your elderly loved one had access to electric devices that could keep mentally alert, physically safer, connected to family and engaged with their community? Fortunately there are devices that facilitate all this and more. Hooking elderly loved ones up with the right technology and electronic devices provide them with all kinds of ways to enhance their lives. The elderly have a reputation for knowing nothing about technology and avoiding it at all costs. However, nothing is further from the truth. According to a study from Pew Research, 4 in 10 seniors have a smartphone and that is almost double from just a few years ago. For seniors that are reluctant to give modern technology gadgets a try, it’s easy to get them interested in what family members, elderly care aides and friends are using and playing. DVRs have changed the way people watch television and now there’s no excuse to miss a favorite show. Elders can learn to program the DVR so they can catch everything from the news to old movie favorites. Especially for seniors who are home bound or less mobile, knowing how to operate the DVR can really enhance how they spend their down time. There are several different brands on the market, but fitness trackers are helping people meet their fitness goals every day. Seniors can set goals for how much activity they want to get in a day and program the fitness tracker to track their movements. They figure out how many calories are burned, how many miles walked each day and much more. There are even some that remind wearers to get up and move if they’ve been sedentary for too long. When an elder needs help in a hurry, there’s no better way to send out an emergency call than with a personal emergency response system. These devices can be wired into the home or worn on the body as a bracelet or pendant. If an emergency arises, like a fall or a heart attack, the elderly wearer can signal for assistance with the push of a button. An elderly loved one doesn’t have to become a hard-core gamer to enjoy playing video games. They come in a range of categories, from puzzles to fitness games. 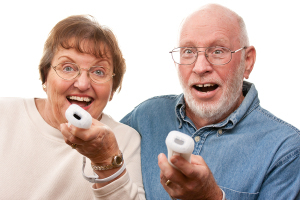 Studies show that video games can actually help the elderly with mental agility and recall. Certain full-body and movement features in video games can even help seniors get fit and have fun. These versatile gadgets are the gateway to all kinds of fun and interesting things to do. Seniors can read electronic books, play mind-sharpening games, send and receive emails and look at photos. A bonus for the touch screen feature, because those are quite intuitive to use and give seniors a chance for immediate results. No matter how reluctant an elderly loved one is to embrace technology, there are a few devices out there that can make their lives infinitely easier, safer and much more fun. Family caregivers, elderly care aides and others can help the elderly by teaching them what they need to know until they feel confident in using it. For Elderly Care Services in Cordova TN, please contact the caring staff at Personal Care Services MidSouth today! This entry was posted in Elderly Care Cordova TN, Personal Care Tips and tagged Elderly Care Cordova TN. Bookmark the permalink.